A challenging and technical track tested every rider and machine in of each of the classes. Perhaps one of the most challenging courses in recent years meant that the winners were not only the fastest but also the most skilled and technical athletes on track. 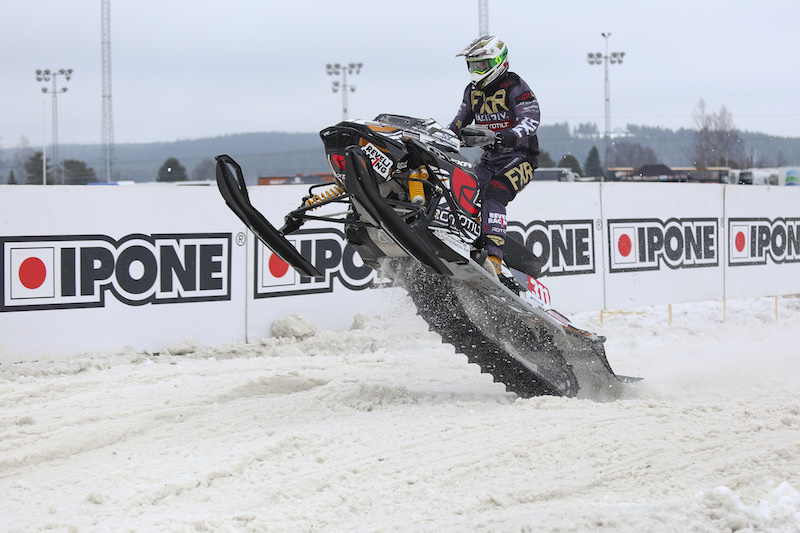 The first final of the FIM Snowcross World Championship saw Oskar Norum take the holeshot and early lead while the 5 time and defending champion Adam Renheim closed the gap in second. The push from Renheim was not quite enough as the #40 of Norum took the race win. Renheim was 9.2 seconds back at the finish while Aki Pihjala and Adam Öhman came across the line over 38 seconds later. The remaining 16 riders were all at least one lap down. The high pace of Norum and Renheim continued at the start of Race 2 with the #40 Norum again taking the lead. Renheim was applying pressure in second which put in him in the perfect position to take advantage of Norum’s crash in the second half of the race. Norum got back into the action but in 6th position while Renheim took the win and his 6th FIM Snowcross World Championship title, the 4th in a matter of 4 years! Aki Pihjala took 2nd in the race and second overall while Norum’s 1-6 gave him 3rd overall. Adam Renheim, "Feels and sounds good when I hear 6 championships, but there has been a lot of hard work. It was a tough day and tough track. We made some changes after first heat which worked well. I was too patient in the first final, so in the second I felt good, but I knew it was going to be a battle." Aki Pihjala,"It feels good, 2nd best in the world... but I’m still looking for that gold." Snowcross World Championship Race 1 Top 10: 1. Oskar Norum (SWE, Polaris), 16:57.758; 2. Adam Renheim (SWE, Ski-Doo), +0:09.210; 3. Aki Pihjala (FIN, Lynx), +0:38.477; 4. Adam Öhman (SWE, Lynx), +0:42.857; 5. Magnus Reiten (NOR, Lynx), -1 lap(s); 6. Lukas Johansson (SWE, Ski-Doo), -1 lap(s); 7. Emil Harr (SWE, Lynx), -1 lap(s); 8. Pieti Puhakka (FIN, Arctic Cat), -1 lap(s); 9. Pär Vikman (SWE, Arctic Cat), -1 lap(s); 10. Joonas Keskiaho (FIN, Lynx), -1 lap(s). Snowcross World Championship Race 2 Top 10: 1. Adam Renheim (SWE, Ski-Doo), 17:25.550; 2. Aki Pihjala (FIN, Lynx), +0:02.485; 3. Emil Harr (SWE, Lynx), +0:39.219; 4. Magnus Reiten (NOR, Lynx), +0:43.978; 5. Adam Öhman (SWE, Lynx), +0:54.505; 6. Oskar Norum (SWE, Polaris), +0:58.775; 7. Pär Vikman (SWE, Arctic Cat), -1 lap(s); 8. Oskar Englund (SWE, Lynx), -1 lap(s); 9. Joonas Keskiaho (FIN, Lynx), -1 lap(s); 10. Mikko Osmo (FIN, Lynx), -2 lap(s). Snowcross World Championship Overall top 10: 1. Adam Renheim (SWE, SKI), 47 points; 2. Aki Pihjala (FIN, LYN), 42 p.; 3. Oskar Norum (SWE, POL), 40 p.; 4. Emil Harr (SWE, LYN), 34 p.; 5. Magnus Reiten (NOR, LYN), 34 p.; 6. Adam Öhman (SWE, LYN), 34 p.; 7. Pär Vikman (SWE, ARC), 26 p.; 8. Joonas Keskiaho (FIN, LYN), 23 p.; 9. Pieti Puhakka (FIN, ARC), 20 p.; 10. Jarno Hietalahti (FIN, SKI), 19 p.
2017 FIM Women’s Snowcross World Cup Winner Elina Öhman made a late call to race in this year’s event after some uncertainty and making a trip back from the USA. The decision proved to be the right one though as she took both holeshots and cruised to double race wins even suprising herself with the result. Öhman had the closest action off the start when she fought for the holeshot against Norway’s Malene Anderson but the #17 of Öhman soon pulled away while the battle for 2nd and 3rd went on but in the end no passes for the podium were made. In the overall it was Öhman’s 1-1 finishes taking the Overall Cup win with Malene Andersen 2nd and Ellen Bäcke 3rd. Elina Öhman, "Perfect, better and easier than expected, I’m super happy to finish the season with a gold." Malene Anderson, "I had a problem with my leg which is annoying, and I’m going to see the doctor next week, but I’m still happy." Women’s World Cup Race 1 Top 10: 1. Elina Öhman (SWE, Polaris), 12:36.186; 2. Malene Andersen (NOR, Arctic Cat), +0:14.632; 3. Fanny Wikström (SWE, Lynx), +1:02.315; 4. Wilma Jonsson (SWE, Lynx), +1:03.149; 5. Ellen Bäcke (SWE, Polaris), -1 lap(s); 6. Matilda Johansson (SWE, Ski-Doo), -1 lap(s); 7. Jenny Lundström (SWE, Lynx), -1 lap(s); 8. Birgitte Olsen (NOR, Lynx), -1 lap(s); 9. Matilda Norberg (SWE, Ski-Doo), -1 lap(s); 10. Carolina Wärn (FIN, Lynx), -1 lap(s). Women’s World Cup Race 2 Top 10: 1. Elina Öhman (SWE, Polaris), 13:21.231; 2. Malene Andersen (NOR, Arctic Cat), +0:13.647; 3. Ellen Bäcke (SWE, Polaris), +0:21.273; 4. Matilda Norberg (SWE, Ski-Doo), +1:06.591; 5. Fanny Wikström (SWE, Lynx), +1:08.159; 6. Matilda Johansson (SWE, Ski-Doo), +1:09.349; 7. Jenny Lundström (SWE, Lynx), +1:12.749; 8. Carolina Wärn (FIN, Lynx), -1 lap(s); 9. Birgitte Olsen (NOR, Lynx), -1 lap(s); 10. Wilma Jonsson (SWE, Lynx), -1 lap(s). Women’s World Cup Overall Top 10: 1. Elina Öhman (SWE, POL), 50 points; 2. Malene Andersen (NOR, ARC), 44 p.; 3. Ellen Bäcke (SWE, POL), 36 p.; 4. Fanny Wikström (SWE, LYN), 36 p.; 5. Matilda Norberg (SWE, SKI), 30 p.; 6. Matilda Johansson (SWE, SKI), 30 p.; 7. Wilma Jonsson (SWE, LYN), 29 p.; 8. Jenny Lundström (SWE, LYN), 28 p.; 9. Birgitte Olsen (NOR, LYN), 25 p.; 10. Carolina Wärn (FIN, LYN), 24 p.
The World class racing was also added to by the racing of the best European riders in the FIM Europe Snowcross Championship. Filip Öhman was the most impressive once the racing started taking the lead of Final 1 from the first lap and never losing the position before finishing nearly 20 seconds ahead of second place rider Jens Vikman. Final 2 was led by Robert Lunden for most of the time but with 4 laps of 16 remaining he dropped to 4th handing the lead to Öhman. After holding on to the inherited lead for the final laps Öhman took the race by 4 seconds and the overall championship win with the maximum 50 points! 2nd overall went to Jens Vikman and Gustav Salomonsson took 3rd.